"Utah is a land of extremes. It has everything -- deep, narrow slot canyons, elaborate river systems, fertile valleys, deep blue lakes, lonely deserts, and a maze of arches, rock spires, and pinnacles. It lacks only an ocean, but since beaches and saltwater exist at the Great Salt Lake, it nearly has that, too. 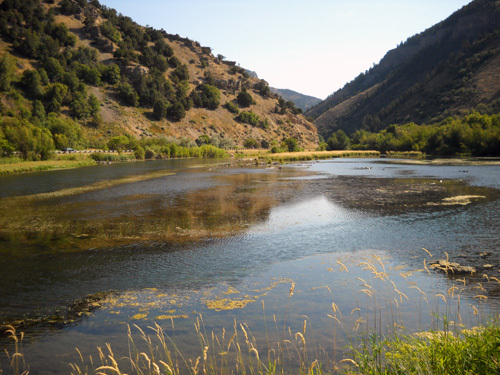 . ."
This is a short "chapter" in our summer trip: just one week in the Logan Canyon of northeastern Utah, general site of the Bear 100 race that Jim will be running the weekend of September 25-26. Our stay is rather short, but I've got plenty to say about it! Brevity has never been one of my strong suits. The more reader response I get that thanks me for useful and/or entertaining content, the more fun I have writing entries and taking photos with this journal in mind. 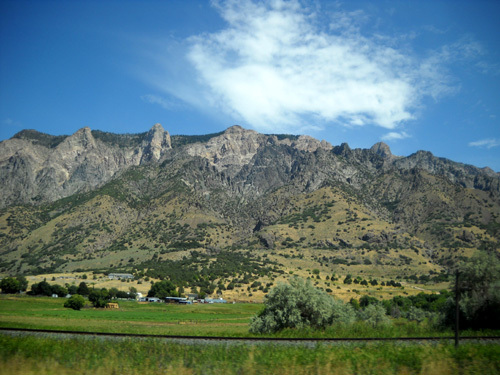 The first two Logan Canyon entries are mostly a travelogue about getting here, our campground, and things to do and see in this area (for readers who are more interested in travel, destinations, and RVing than running and hiking). Two more entries will feature local trails we ran and hiked, including part of the Bear course. Oh, and I'll probably include a mouse story in here, too . . .
Photo tip: The first thirteen pictures in this entry are what I call "windshield shots," ones I took from inside the truck while Jim was driving. Our current camera, an inexpensive Nikon Coolpix L20, does a good job of freezing action in landscape mode when I shoot scenes that are ahead of us. Side shots tend to be fuzzy close to the road because it is "moving" faster. I usually just crop out some of the foreground and use the middle distances and background in side shots (e.g., the 10th and 11th photos below, taken along Hwy. 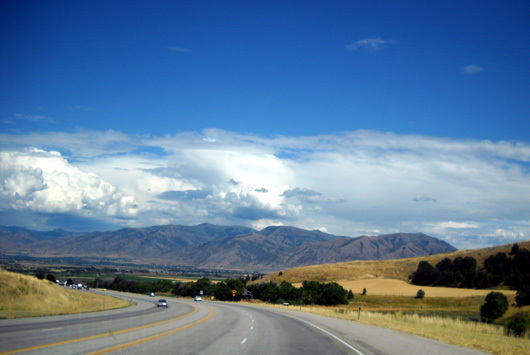 91 between Brigham City and Logan). Anyway, after I discovered several years ago that I could take landscape shots in a moving vehicle it has saved a lot of time (and Jim's sanity) not having to stop to take pictures when I want to. There is a lot to see and do here; previous visits to various parts of the state over the last 30+ years have barely scratched the surface: the rock fantasylands of Bryce and Zion National Parks, majestic granite peaks in the Wasatch Mountains, colorful canyons and plateaus, shimmering white salt flats, lush green valleys and meadows with serpentine rivers like the Bear that make you dizzy when you try to visually trace their path from a mountain summit. And there's so much more we haven't seen yet. Nothing makes me happier than exploring new places, especially by foot. We had some time to kill before Jim runs the Grand Teton 50-miler as his last long training run for the Bear, and the Logan area is sort of on the way up there. We wanted to familiarize ourselves with a few miles of the Bear 100 trails and crewing locations that we have never seen; the course has changed significantly since Jim last ran the race in 2003. So it made sense to stop here for a few days and start checking out the place. Early next week we'll head up to the Idaho-Wyoming border west of the Teton Range for the Grand Teton Races (GTR). After a week there, we'll be back here in the Logan Canyon area for about three weeks. Then we'll probably head back to our house in Virginia for a couple months. In the last entry five days ago (Monday) we were in transit from Leadville, CO to the Logan, UT area and had just driven 185 miles to Grand Junction, CO, where we spent a quiet but rainy night in the Sam's Club parking lot. We still had another 364 miles to Logan Canyon. Tuesday morning dawned sunny and a little cooler, perfect conditions for a ride through some more scenic territory. I don't think there is any ugly terrain in either Colorado or Utah! 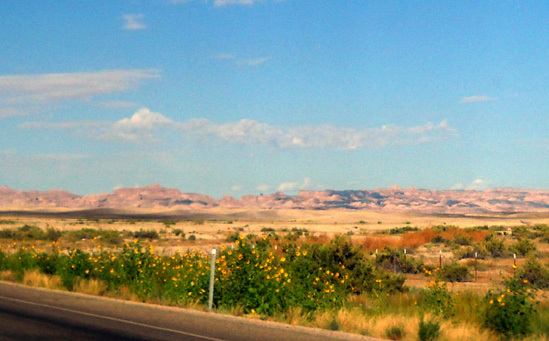 From Grand Junction we followed I-70 west into Utah to US Hwy. 6, the same route we took to and from Salt Lake City last month when we drove to Reno/Carson City, NV for the Tahoe Rim Trail race. 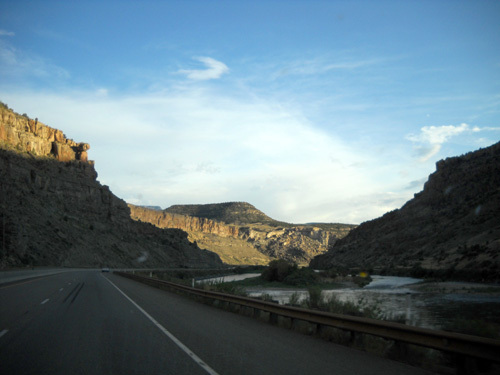 This route passes through the large Colorado Plateau area of Utah, where the Colorado and Green Rivers snake through colorful canyons and uplifted plateaus that rise as high as 11,000 feet. Hwy. 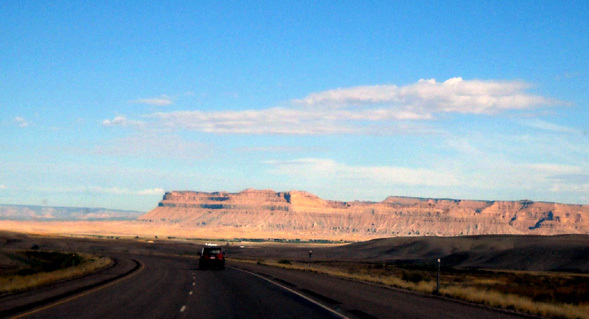 6 is a a fast, efficient tangent that cuts off many miles between I-70 and 1-15 north through Utah. Each time we've taken this route we've been able to cruise about the same speed (65-67 MPH) as we drive the camper on freeways. Even though it is partly two-lane, there are passing lanes on long hills and plenty of straightaways where you can pass slower vehicles. And it's scenic, too, with lava beds and vast rangelands near the road and views of mountain ranges to both the east and west. Population is very sparse along this road, especially at the southern end (next photo). 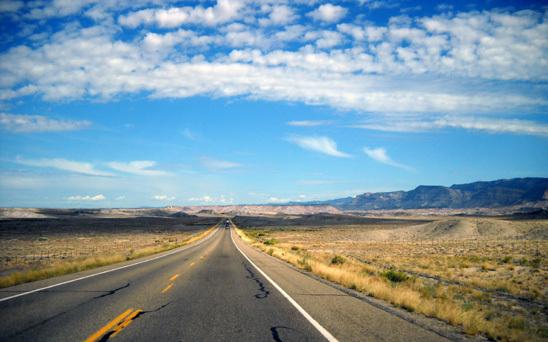 There are no towns in the forty-six miles from the freeway to the town of Wellington, UT. When we drive through vast areas of rangeland, mountains, or deserts like this in the western part of the country I always think of the huge contrast with densely populated areas. With no structures or people in sight for mile after mile after mile, it's hard to imagine living on top of one another in a busy, noisy, crowded city. When I'm in a crowded city, frustrated with traffic, a cacophony of noise, and so many people around me, it's hard to believe there are such quiet, vast open spaces in other parts of the country! And guess which end of that scale I prefer?? 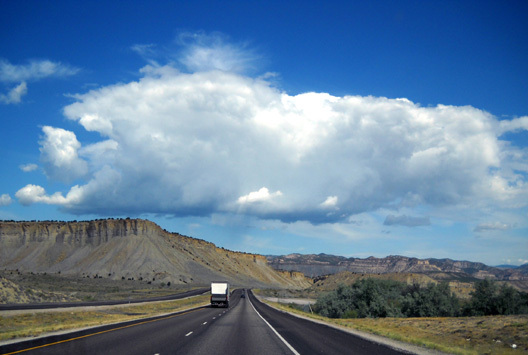 There are many people who have never seen "big sky country" (and what they probably consider a lot of "nothingness") except on television or in videos and movies. I wonder if they can even imagine what it's like in person? 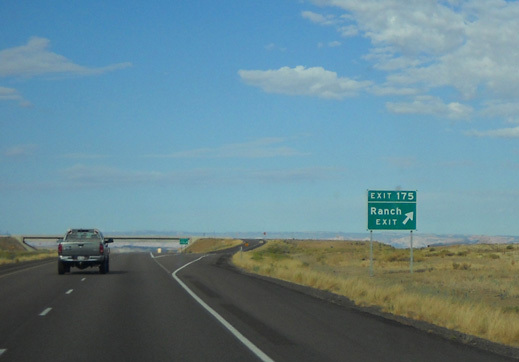 For that matter, imagine owning so many acres of land that you need your own freeway exit! Hwy. 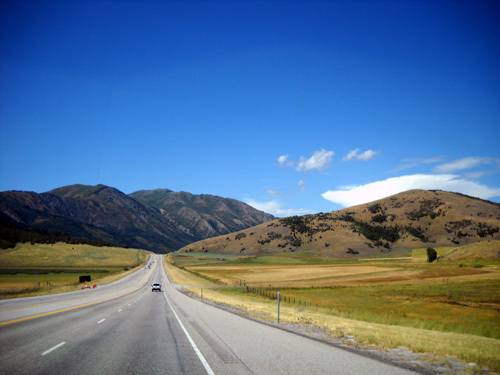 6 becomes more hilly and curvy as it heads north through the towns of Wellington and Price and into the foothills of the Wasatch Mountains between the Uinta and Manti-La Sal National Forests. 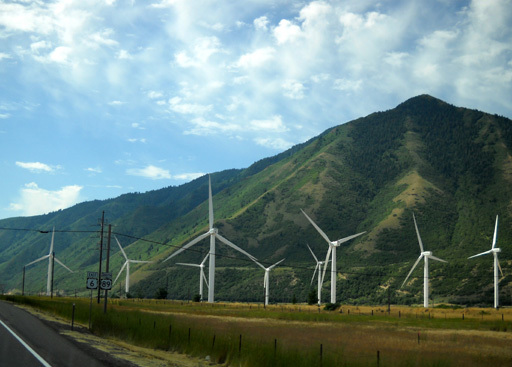 As in July, we headed north on I-15 past Provo to greater Salt Lake City but instead of hanging a left on I-80 west, we continued north past Ogden. 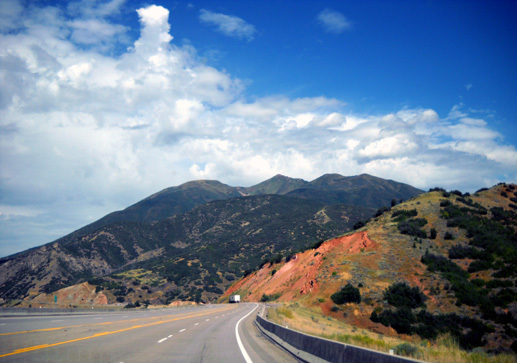 We had great views of the Wasatch Mountains to the east all along this 100+ mile stretch of freeway. Views of the vast Great Salt Lake are not as prominent on this route as along I-80, however. We were almost to our destination by mid-afternoon. When we reached the Brigham City area we turned off onto US Hwy. 91 for the very scenic 24-mile drive northeast to Logan and the Cache (pronounced "Cash") Valley. 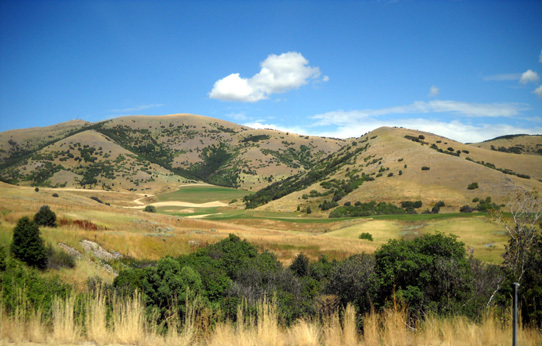 My first impression was what a beautiful area it is, full of lush farms with the Bear River Range and Wasatch-Cache National Forest for a backdrop to the east (above) and flanked to the west by the peaks of the Wellsville Mountain Range. I was equally impressed with the appearance of the city of Logan itself. I'll talk more about it in the next entry. Jim had already done some research by internet and phone of the national forest campgrounds up Logan Canyon east of town but we'd made no reservations yet. We needed to eyeball sites to see if they'd be big enough for our rig. Park personnel warned us not only about tight and/or short sites, but also narrow roads with sharp turns and low-hanging branches in most of their campgrounds. They assured us that there are a few adequate spots for moderate to large RVs but not many. However, they also said this isn't a crowded time because kids would be back in school and we should be able to find some appropriate campsites that were still unoccupied. Lognn River near Spring Hollow Campground ; the scenic byway is to the left in the background. 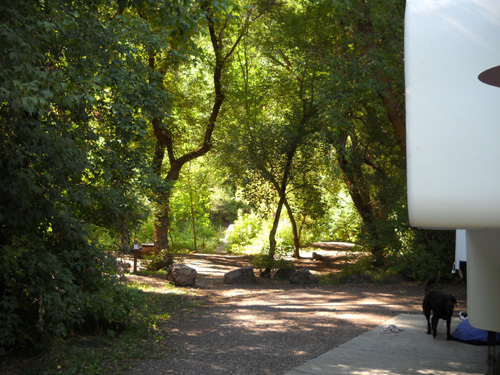 If you have a small camper (under 20 feet long), you're in luck in this area; there are numerous camping options for you in the forests and meadows, and along the Logan River, all up and down the 40+-mile long canyon. As we came into the southern end of Logan we unexpectedly passed an attractive WalMart. Now where did that come from? It wasn't included in the 2009 Rand McNally road atlas that lists all the WalMart and Sam's Club stores. Turns out, it is brand new and hasn't been open for more than a month. There's another older WalMart at the north end of town, too; it and Sam's are in our atlas. We pulled into the new location, not to spend the night, but to get supplies. We also stopped at Sam's Club for other items, noting that it had plenty of space for us to park that night if we were unable to find a suitable national forest campground before dark. Then we headed east on US Hwy. 89 past Utah State University to the edge of town and visited the very nice Logan Ranger District Visitor Center that overlooks the entire valley. What a great view from the Lady Bird Overlook! 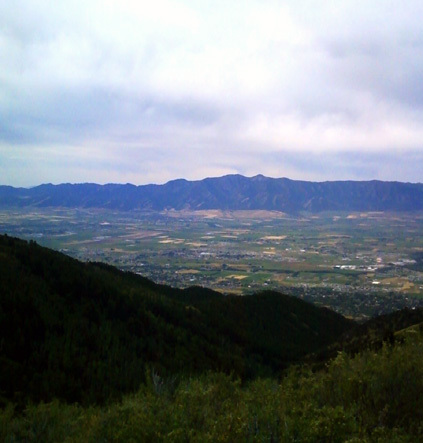 It's not as great as from one of the nearby mountaintops (below), but just about as expansive of a view as you can get by driving a paved road to a convenient viewing point in Logan. 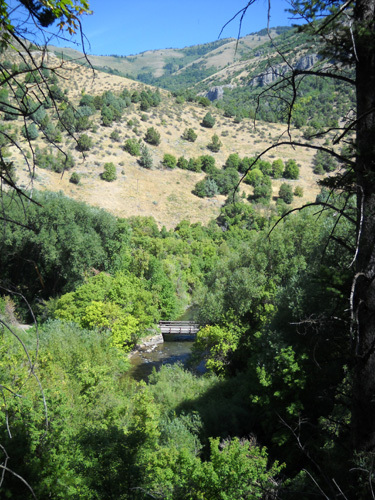 We picked up some helpful maps and brochures about Cache Valley, Logan Canyon, the Wasatch-Cache NF, hiking trails, and other recreational opportunities in the area. We also got some helpful advice from the ranger on duty, who kindly stayed a few minutes past closing time (4:30 PM) for us, about the campgrounds we'd pass as we headed up through Logan Canyon. She said there was not much dispersed (free) camping that would be large enough for our camper until we'd driven about twenty miles. That's really farther from Logan than we preferred to be this week but it might be suitable when we return to the area for two or three weeks before the race. It would put us near the last part of the race course, which we also want to check out before race day. The ranger confirmed Jim's hunch from his internet and phone research that our best bet for a paid site would be at the Guinavah-Malibu Campground five or six miles up the canyon. Since we had only a few hours of daylight left, we decided to drive directly to the campground she recommended. We walked around the various loops and found severa; unreserved sites that were large enough for our rig. We chose one far back into the Guinavah (pronounced GWIN-a-vah) loops past a bridge over the Logan River, near the CCC-built amphitheater. It is also near a bathroom and has a large wooded area on three sides for privacy. Only a few of the 40 individual campsites and none of the three group campsites were occupied when we arrived on Tuesday. Enough folks came in this weekend to fill half or more of the sites. If we decide to come back here for the race later in the month, we know which site(s) we can reserve ahead of time. It will probably be busier after the leaves start to turn; this area is renowned for its brilliant fall colors. Because we didn't know what any of our other camping options were, we initially paid for only one night at Guinavah. After supper we unhooked the truck from the camper and drove up the canyon to look at some other campgrounds and a couple of dispersed (free) camping areas. We soon decided that it would be most convenient to remain at the Guinavah Campground this week. On Wednesday morning we paid for another four nights so we could keep our spot. We continued to investigate camping options for our return stay in the area, however. The national forest campgrounds have two-week limits; we don't know if they enforce those off-season but since we'll probably be here for three weeks or more, we need some alternatives. Jim checks out the unique stone amphitheater at Guinavah Campground. 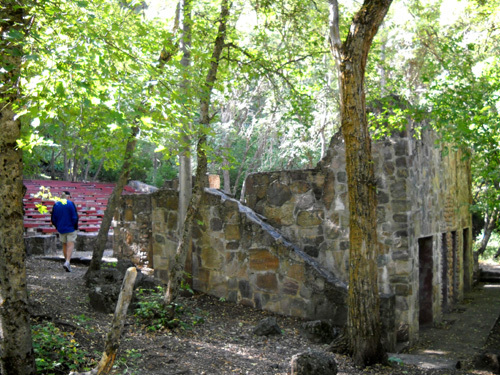 Built by the CCC in the 1930s, it has several rooms on the lower level for use by performers, etc. 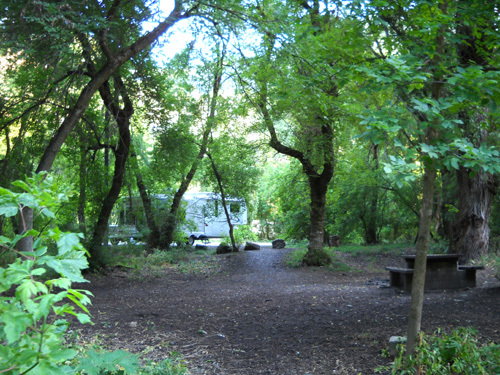 Guinavah-Malibu CG is described in the slick Logan Canyon brochure published by the Cache Valley Visitors' Bureau as "the best-loved campground in the Canyon." I can see why, after checking out most of the others. It is fairly close to Logan, high enough in elevation (about 5,200 feet) to be noticeably cooler than the valley, and in a gorgeous wooded setting that straddles the Logan River. It also provides access to several trails; I'll talk about those in a separate entry. That's our camper in the background. There are no other campsites close to us. There is a rather complicated reservation system that even the campground host had trouble clarifying, but basically at least half of the campsites can be reserved online a minimum of four days ahead of time for up to two weeks. Less than four days and you have to pick an unreserved site, then put cash or a check in the box at the entrance board to each campground. Campsites at Guinavah-Malibu are $15/night. Other National Forest Service campgrounds in the canyon range from $12 to $20, depending on location and amenities. Guinavah-Malibu has no electrical, water, or sewer hookups. We are close enough to a water spigot to run a hose from it to our camper's fresh water tank. There are several very clean restrooms with flush toilets and sinks in each campground. There is no dump station. The major downside to most of the NFS campgrounds along US Hwy. 89 through the canyon is, surprisingly, road noise. 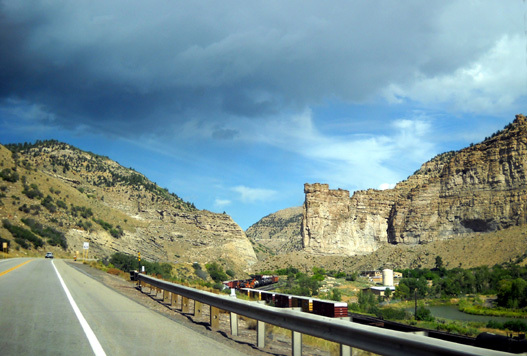 This 41-mile stretch of road from Logan to Garden City is a designated National Scenic Byway yet you'd be amazed how many big road construction and commercial trucks drive this winding, mountainous road! Not only do they use noisy air brakes going downhill to Logan, they are also intimidating if they're tailgating your smaller vehicle in that direction. Our camper is to the right of this bridge which crosses the Logan River. I'm on the Riverside Trail about 100 feet above the Guinavah Campground. The other downside to us is that any campground a mile or more up the canyon, including Guinavah, doesn't have Verizon or other cell service. Nor do we have TV reception. That may be just fine for folks who are out for the weekend or a week and want to "get away from it all" but if you practically live in your RV like we do, it's nice when you can get online and make phone calls from home. We have to drive down several miles to the city to make calls and get internet connections on our laptop computer. *** Remember Rules #1 and 3 from the AT trek? Be safe and have fun! I've tried to apply all three "rules" to my life ever since. Some times I'm more successful than others!